This is a very special guest post from a very special person. My father died on December 20th., 1956. I had turned twelve some six weeks before this day. My mother, some eighteen years younger than my father, in due course remarried a professional musician, Richard Mills, and in 1959 my mother gave birth to a girl who was named Eleanor. Those who can do the arithmetic will calculate that I was fifteen years the elder brother to Eleanor. Indeed, almost to the day for I was born on November 8th and Eleanor was born on November 16th. Thus it is with very great pleasure indeed that I offer a guest post from Eleanor. Zina, now well past the puppy days! We bought Zina as a puppy just over 2 years ago. She was the most adventurous of the litter and a “liver nose” Ridgeback, which is a silky type with no black markings on her face. We knew from the onset that she was a bright dog, but usually for her own benefit. She quickly learnt that if she was shut out of the house she should run around the house trying every door in case one was unlocked. She did this by stretching up so her front legs acted like arms on the handle. She also managed to prise open our sliding patio doors to get in on one occasion. We soon realized and made sure that all doors were locked. Living in South Africa we have some extra security measures you might not be familiar with. Obviously most people are aware of high walls and electric fences, but some houses have internal security gates (often called slam gates). We use one at the bottom of the stairs just as a precaution as we don’t activate any alarms. Sometimes if we want the dogs downstairs (and off the beds!) we lock this security gate. We were mystified to find that after a few minutes Zina was jumping up and opening our bedroom door after obviously negotiating the security gate! On one occasion we thought we’d hide and look over the stairs to watch. She had learnt that if she put her paws inside the door frame she could shake the metal and gradually work the lock loose. We hoped the burglars weren’t as clever! Her intelligence also spreads to her understanding of the other animals in our house and the need to look after them and make sure they are happy. She is quite enthusiastic in licking everything to say hello, which doesn’t always go down too well. Her friend, Dylan the Jack Russell, is well used to her large boisterous nature and puts up with these slobbering kisses! Our cat usually tolerates the first kiss then decides to gently warn her with a little pat of her paw. After that Zina is a very polite dog. 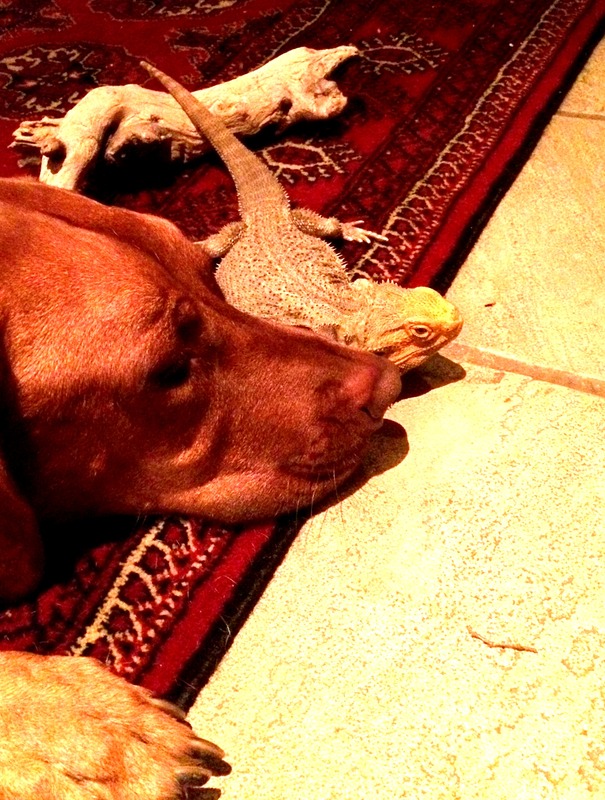 What is most unusual is her attitude to my bearded dragon. I rescued it from an owner who was mistreating it and although I would never choose one as a pet, I couldn’t bear to see it badly neglected. I usually discourage Zina from going on too long with this greeting as although Blizzard is tolerant he can also get fed up. Since developing her newfound maturity and maternal urges, she has become very loving to all our family of pets. It is lovely to see how caring this dog has become and how she definitely puts herself as alpha female and keeps her pack happy and safe. What a heart-warming account of yet another special, loving dog. As you may know, I’m Paul’s younger sister. I grew up with cats, as mum never liked dogs. I secretly always wanted a dog and always loved those models of the Labrador which were used to advertise the guide dog association. 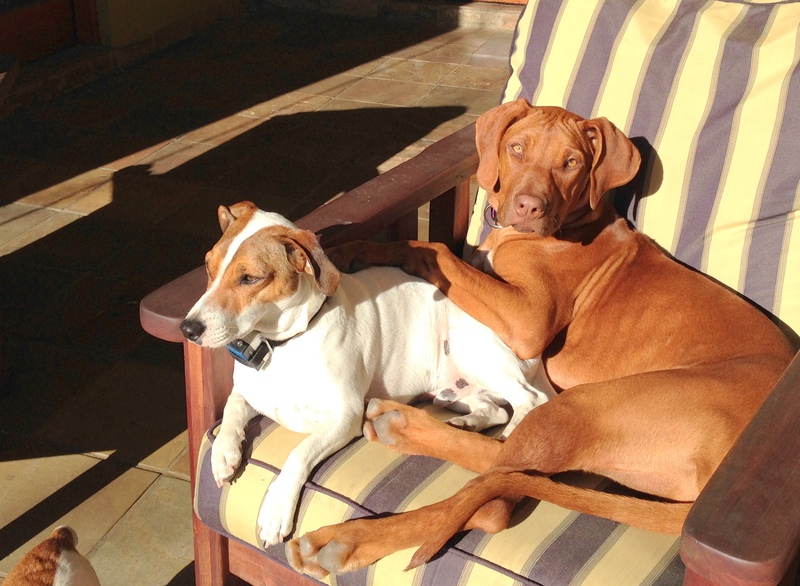 After moving to South Africa it was very common to have dogs, frequently 2 or 3, so my first dog was a Labrador, closely followed by a rescue Jack Russell, another rescue Jack Russell then our Ridgeback. The school’s mission is to be a world-class, South African learning community, building leaders for their time. Redhill School is a Member of the Independent Schools Association of Southern Africa (ISASA). I’m sure that I voice a hope from me and many others that there will be more animal stories from sister Eleanor. It was a pleasure meeting your sister, Eleanor! I loved her story about Zina. I also was the proud owner of a Ridgeback named Arnie. They are gentle souls but fiercely loyal and protective. She sounds just like you, Paul! Both of you have a menagerie of animals which is great. That’s lovely of you to say that, Susan. Best wishes from both of us! Thanks for your comment, Susan. 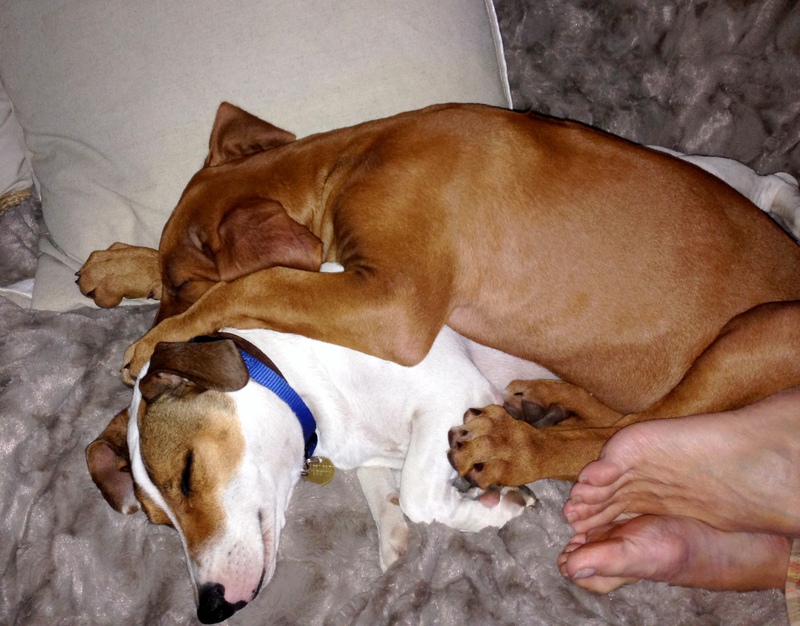 I agree that despite their huge size, Ridgebacks are very gentle creatures. She is a very loving dog and although could never take the place or match the personality of our Labrador (who sadly passed away), she has become a much loved member of the family with her own unique ways. What a stunning beautiful dog. Lovely story. Thank you. It’s so good to have a special and loving relationship with a half sibling. Often times that is not the case. I enjoyed Eleanor’s dog story, it seems she loves dogs and cats as much as you. It is a pity that so many miles separates you and your sisters. Yes, not only do Eleanor and I have a wonderful loving relationship, as, indeed, I have with Elizabeth but I had a great relationship with her father, Richard Mills. It was ‘Dad’, as I used to call him, that started off my interest in radio and electronics resulting in me becoming a Radio Amateur (Ham), G3PUK, and studying electrical engineering at Faraday House Engineering College in Southampton Row, London. Not that I ever used that knowledge professionally but I can at least re-wire a socket!! But you are correct in that we did rather spread ourselves around the globe: Tokyo, Johannesburg, Merlin in Oregon. Very wise thoughts from you. That’s what I love about this blogging world, the incredible connections that are made between folks. Thank you! This is a lovely tale about such a wonderful dog. That one sounds special indeed. I hate that anyone has to live in fear and take so many safety precautions but that seems to be the way of the world these days. i had a dog, cat and a rabbit that all cohabited like family. When I took the dog to the groomer, the cat went too (sitting quietly between the dogs front legs) and was groomed also. She was a Himalayan. 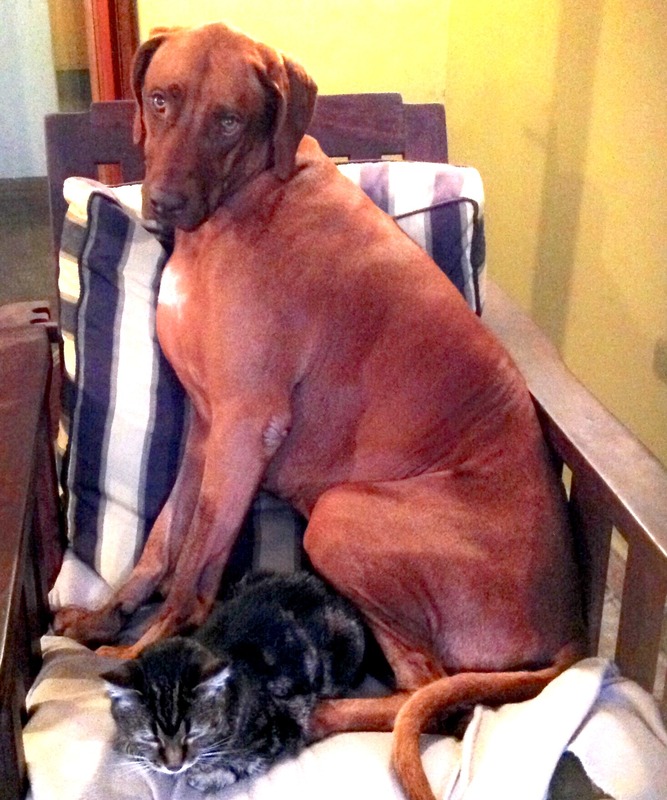 The rabbit was found in the front yard and the dog and cat adopted her. Animals seem quicker to take in strays than humans. Is Merlin in Oregon a brother? Merlin is the name of the place where Jean and I live. Merlin in Southern Oregon. But I am also Eleanor’s brother. I had to look it up. I’ve been through Grants Pass so often on my way to and from Portland where I now live. I love Oregon. Yes, we also adore where we live here in Southern Oregon especially as it was pure chance that brought us here. Do you still come south from time to time? If you do, drop me an email and we can swap telephone numbers and possibly arrange to meet. I’m no longer able to drive distances. I still make it to the grocery, the book and fabric store. Bells Palsy did a number on me 7 years ago. I really miss driving to places. But if you ever come to Portland, send a note. I can usually manage 20 plus miles. Thank you. 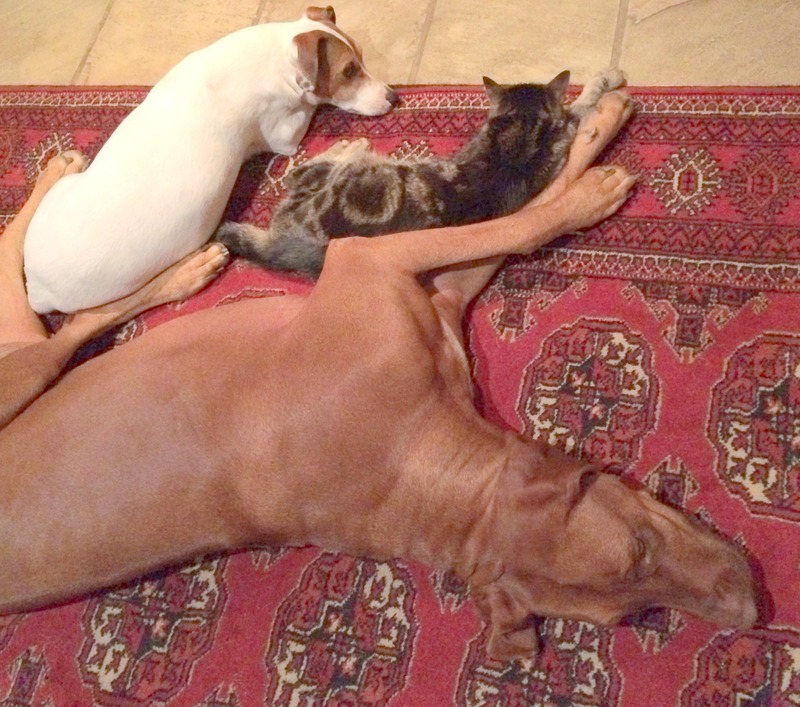 At present we are pretty well tied to home with our animals. But if that were to change, yes, would let you know. Have a wonderful weekend. It was delightful to meet your sister Eleanor Paul, and straight away you can tell you are kin.. LOL.. the love and rescuing of animals.. And I hope that she will be a frequent guest visitor.. I am sure Eleanor has lots of tales to tell regarding that wonderfully clever four-legged Zina.. Loved all those additional photo’s too .. Many thanks for sharing Eleanor..
Hope Eleanor reads your greetings soon.